Why is the Greek tail wagging the global dog? 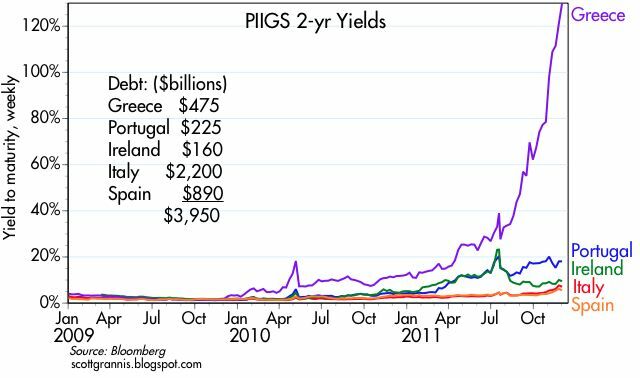 These two charts distill the essence of what is currently mesmerizing markets and economies around the world: the growing likelihood of one or more PIIGS defaults, which could potentially involve several trillion dollars worth of debt. Surely, the thinking goes, a multi-trillion dollar default would absolutely devastate the Eurozone economy, dragging most other economies down into an abyss even worse than the one we teetered on the edge of in late 2008. Although "trillions" is undoubtedly a pretty huge number of dollars, the value of liquid, global bond and debt markets is about $110 trillion. 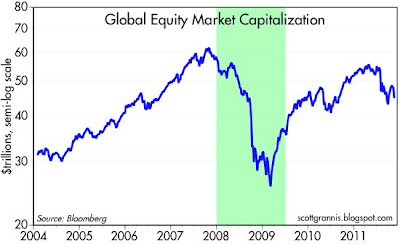 The chart above shows the market cap of global equities, currently some $45 trillion. According to Merrill Lynch's indices of liquid bond markets, there are some $42 trillion of investment grade global bonds, and $21 trillion of high-yield global bonds. As the chart above also shows, the destruction (and creation) of trillions of dollars of equity cap happens routinely, sometimes on a daily basis. In one month alone (mid-September to mid-October '08), $15 trillion of global equity market capitalization was wiped out—not to mention the trillions that were erased from U.S. mortgage-backed securities—yet it was only a matter of 7-8 months before a global recovery got under way. The world is a pretty big place, and markets are very deep. Italy's entire national debt is only 2% of the value of global capital markets, and much less if we add in the value of global property markets. 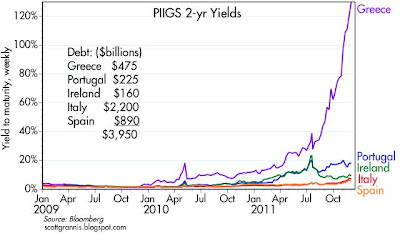 Can the relatively tiny PIIGS tail seriously wag the huge global economy dog? Stocks and bonds represent claims on future cash flows, and those cash flows in turn are generated by economies that are driven by billions of industrious workers utilizing hundreds of trillions worth of factories, roads, bridges, telecommunications systems, etc. Wiping out a few trillion of claims on those cash flows does not erase an economy's productive potential. It would be extremely disruptive, to be sure, but it's highly likely that at least 95% of those working today would be working and producing in the days, weeks, and months following even a multi-trillion dollar PIIGS default. A big PIIGS default doesn't need to be earth-shattering. One important consideration that is often overlooked is that the world has had some 18 months to prepare for this. It won't be a "black swan" event that catches the world by surprise. The worst part of the financial collapse in late 2008 was just that: it came out of nowhere, totally surprising all but a very few, and the ensuing panic selling made things far worse than they otherwise would have been. Isn't the real concern a disorderly break up of the Euro? I would think that in the short term that would be very disruptive to business relationships throughout the world. By the way, congrats on being mentioned in the Times. As long as they spell your blog name right, the free publicity is great! Why would a break-up of the Euro so bad? 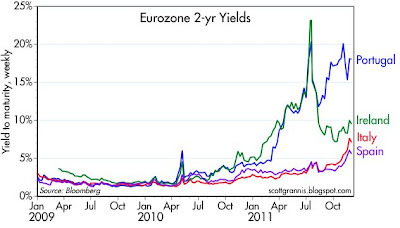 Seems to me that Italy, Spain and Greece badly need control of their own central banks again. Yes, they need to have a printing press so that investors know they cannot default. Sure, in a perfect world, nations would never resort to printing money. But there are times when it has to be done. How is tight money working out in Europe? Euro stocks down 60 percent since 2000. Down 80 percent inJjapan since 1990. While I agree with you on an intellectual level (and am investing accordingly), we can't completely discount the domino effect and unseen consequences. I remember a similar argument being made by others a few years ago that sub-prime mortgages only made up a small part of our economy. I never in my wildest dreams could have made the calculation that overvalued real estate in about 5 to 10 markets in the US would cause me to lose 50% of the value of my stock portfolio value.